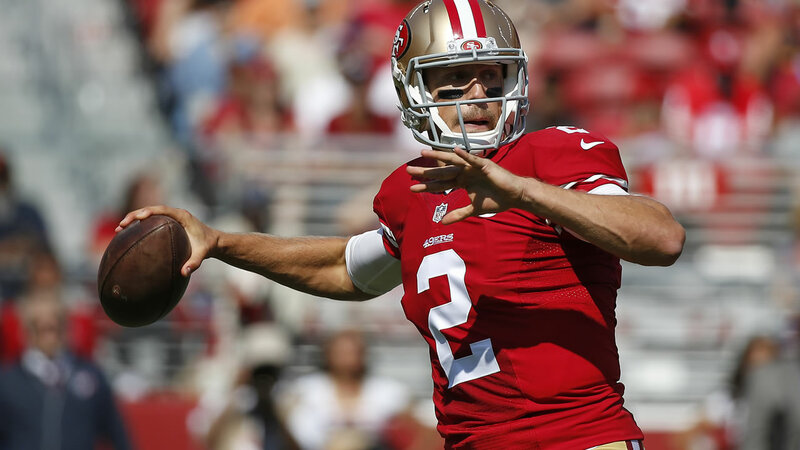 SANTA CLARA, CA -- Blaine Gabbert had the stage to himself in San Francisco's quarterback competition with Colin Kaepernick nursing a sore shoulder and provided a strong finish to an uneven performance in the exhibition opener. Gabbert overcame a shaky start to throw a 43-yard touchdown pass to Vance McDonald before the Houston Texans rallied in the second half against San Francisco's reserves to beat the 49ers 24-13 on Sunday. "There were ups and downs," Gabbert said. "But we saw when we got into the groove what we can do as a unit." Brock Osweiler didn't fare as well in his Texans debut, failing to lead Houston to any points in three drives. Houston got on the board early when John Simon returned a fumble by Carlos Hyde 41 yards for a touchdown but struggled to generate any offense with its starters. "Was it completely what I wanted tonight? Absolutely not. But rarely is it ever," Osweiler said. "I think the biggest thing about tonight is we did some really good things offensively and we know we have some things that we need to work on and grow and get better at." With Kaepernick sitting out with tightness in his throwing shoulder, Gabbert got to make his case in the battle to win San Francisco's starting quarterback job for first-year coach Chip Kelly. "The good thing is that he did settle down," Kelly said. "There were some real positives that we can build on but there were some throws that even if you ask Blaine, he'd say he wished he had those back." "To put on the Texan uniform, and run out of the tunnel as a team for the first time, it was certainly special," Osweiler said. For more San Francisco 49ers coverage, click here.